In North Carolina, a Southern Baptist church is winning souls for the Lord. Elevation Church and its pastor Steven Furtick have built a reputation as one of the Southern Baptist Convention’s fastest growing and most successful congregations due to the staggering number of people baptized on Sunday mornings. This may not seem significant but the SBC – the largest Protestant denomination in the United States – has seen a steady decline in baptisms over the past decade years. According to a report compiled by Lifeway Christian Resources (an arm of the SBC), 2010 saw a 5% drop in the number of baptisms and a 0.15% decline in membership, a trend all too familiar to many mainline Protestant denominations. 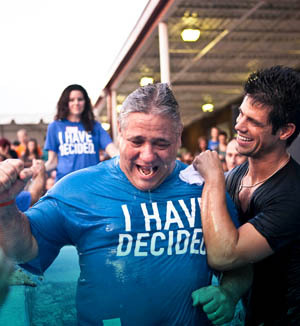 Yet Elevation Church in Charlotte, NC reported 3,519 baptisms in the first eight months of 2013 (Huffington Post 2014). That comes out to an average of 440 baptisms every month or 110 every week. Compare this number to the number of baptisms in all Southern Baptist churches in 2012, which came in at just under 315,000 (Baptist Press 2013). One church, in the first 8 months of 2013, has already baptized the equivalent of 1.1% of all 2012 baptisms in the SBC. As you are probably not surprised to hear, Elevation Church boasts an average of 14,000 worshippers a week at nine campuses in the Charlotte, NC metro area. And yet, more than 3,000 baptisms in less than a year still seems to be an unusually high number. Others questioned this number, leading to an investigation by NBC Charlotte that revealed Elevation Church may be planting the first responders to the altar call – resulting in the “spontaneous” baptisms – in order to attract more people to the baptismal fount (the report also speculates that Elevation has been concealing financial information from donors and church members). If Elevation Church organizes their baptisms, is the message and meaning behind the sacrament diluted? It’s important to note that Furtick and Elevation Church are certainly not the first to engage in spontaneous baptism. J.D. Greear writes on this very topic in 2012, stating that spontaneous baptism is actually more biblical (Why We Sometimes Baptize on the Spot, 2012). 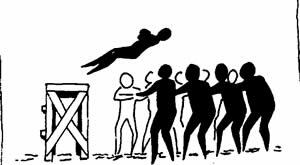 Many pastors and lay people have taken up the issue, debating whether spontaneous baptisms as genuine commitments to God, whether those being baptized realize the implications of their actions. I think this is one of those issues in Christian churches that will never, ever have an answer. We simply have to believe that the man or woman or youth being baptized is ready and prepared to take that step. It is no different than personal conversion – who are we to decide whether someone has a conversion experience? Yet just like the Puritans in the 17th century, church-goers and clergy in the 21st century attempt to validate a person’s faith before allowing baptism or membership, looking for so-called signs of a true Christian faith. In the case of Furtick and Elevation Church, it sounds as if they have bigger problems than simply organizing a few baptisms – the administration and clergy have been under fire for financial purchases and disclosures (or lack thereof). Yet can anyone really judge them on their practice of spontaneous baptism? How is anyone, other than the baptizee, to know whether it’s the right decision and time? Isn’t that the point of faith, to believe and trust without complete justification, especially when it’s not your faith we’re talking about? A Christian’s job is not to judge the worthiness or faith of others, or speculate on whether they are genuine in their faith. A Christian’s job is to grow and continue on one’s own journey of faith, supporting those around them wherever they may be. Form or Function? Material Christianity in the U.S.
Rosaries. Jewelry. Artwork. If you live in the United States, you have witnessed material Christianity. 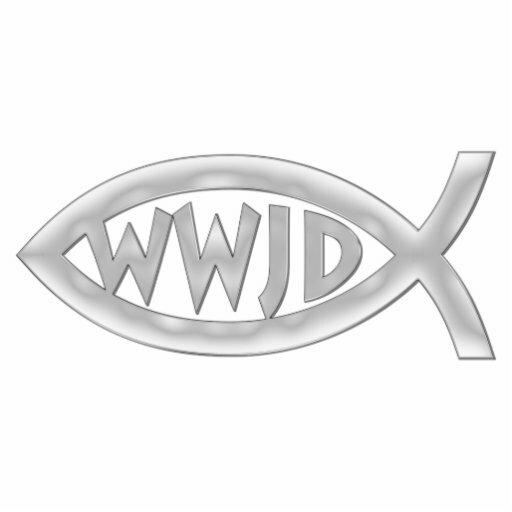 The “What Would Jesus Do?” bracelets, the glittering gold and silver crosses hanging around someone’s neck, the ichthus on the back of a car; this is just a small sample of the thousands of items that make up the material culture of Christianity in the United States. What is material culture? According to Dr. Jules Prown, a professor of Art History at Yale, material culture can refer to both “the study through artifacts of the beliefs-values, ideas, attitudes, and assumptions-of a particular community or society at a given time” and the artifacts or objects themselves (Prown 1982:1). These objects can be virtually anything to which a culture has given value; Prown offers six broad categories of artifacts: art, diversions, adornment, modifications of landscape, applied arts, and devices (Prown 1982:3). By looking at cultural artifacts – material culture – we can understand more about the life and practices of a particular group. Religious groups certainly produce material culture and have for hundreds of years. From the introduction of the rosary in the Catholic church (sometime between the 12th and 15th centuries), to 17th century pulpit cushions of the Puritans, to ornate family Bibles in the 19th century, the Christian church has constantly produced sacred objects for consumption. And while Christians – Catholic and Protestant – have always put value into material objects, it seems that American Christians have taken religious consumption to a new level. There are more than 250 Family Christian stores in the United States selling hundreds of Christian books, Bibles, jewelry, and games; hundreds of online stores sell Christian t-shirts with messages ranging from “Jesus Loves You” to “Keep Calm and Pray On”; and you can buy rosaries and crucifixes costing hundreds of dollars. There is no shortage of Christian artifacts in the U.S. It is tempting to lump all these cultural artifacts together and make observations on American Christianity. Yet when American Christianity is taken as a single unit, significant differences are ignored. With more than 300,000 Christian congregations in the United States, we could spend days sorting through sacred objects and studying the many material cultures within the nation. Here, I’ll tackle just the first major split in American Christianity – Protestant and Roman Catholic. In his 2002 book The Old Religion in a New World, Mark A. Noll observes that “in the last two centuries, Protestants have been avid producers and consumers of cemetery headstones, religious games for children, religious art, and (in more recent decades) bumper stickers, refrigerator magnets, and t-shirts imprinted with religious messages” (259). The Southern Baptists’ True Love Waits popularized purity rings over the past 30 years, and James Avery produces thousands of pieces of Christian-themed jewelry. The material culture of American Protestants leans heavily towards form rather than function, as jewelry and apparel dominate material Protestantism and are rarely parts of religious ritual. On the other hand, Roman Catholics also produce and consume sacred objects but have “incorporated into American practice religious uses of material objects” (Noll 2002: 259). The majority of sacred artifacts coming out of the Catholic church are used in worship and prayer – rosaries, statues and images of saints, and elaborate religious festivals are not just visual markers of faith but practical forms of worship for the Catholic community. This is not to say that Catholics do not wear Christian jewelry or t-shirts, or do not put religious bumper stickers on their cars. But there is a tendency in the Catholic church to produce religious objects that have form and function. Perhaps this is because of Catholicism’s deep roots in Europe, where Catholics produced a rich material culture before immigrants even thought about traveling across the Atlantic. All cultures produce artifacts, attaching value to things like beads, charms, t-shirts, and artwork. Protestants and Catholics in the United States are no exception, both sides consuming millions of dollars worth of religious paraphernalia every year. Often religious consumption overlaps – jewelry or icons or apparel – yet it is clear that the material Christianity in the United States is not homogenous. Protestant/Catholic is just the first distinction – Methodist, Baptist, Episcopal, Northern Catholic, Southern Catholic, Pentecostal, Orthodox…each branch of the church produces their own brand of material Christianity. In the latest round of the clash between evolution and creationism, Bill Nye (the Science Guy) and Ken Ham (the founder of the Creation Museum in Kentucky) will continue a long debate on science in United States schools. And I say to the grownups, if you want to deny evolution and live in your world, in your world that’s completely inconsistent with everything we observe in the universe, that’s fine, but don’t make your kids do it because we need them. Ham, as the founder of the Creation Museum, saw this as an opportunity to reject evolution, question Nye’s validity, and claim that “it’s really people like Bill Nye who are damaging kids” (Ham’s video response). Ham then invited Nye to the Creation Museum for a good old fashioned verbal throw down, an invitation Nye readily accepted. What I think is particularly interesting about this debate is Nye’s position that it is unhealthy and inappropriate to teach creationism to children, but that adults can believe whatever they want. It adds a different spin to the discussion – instead of arguing solely about the validity of evolution or creationism, the conversation will, hopefully, focus on each man’s goals for the function and content of the science classroom. However the debate unfolds, I anticipate an exciting evening in Petersburg, Kentucky. Back in October, I wrote about the debate over biology textbooks in Texas and the high number of creationists on the committee making the recommendations (The Great Texas Textbook Throwdown). Just last week the Texas Board of Education made a move to ease tension over this issue, announcing “it will limit the use of citizen review panels and instead give priority to teachers in determining science and history curricula” (NPR Feb 2014, emphasis mine). Teachers and professors will now be given priority when those serving on textbook review panels are selected, and outside experts may be called in if serious objections arise within the panel. While this is a major blow to many in Texas who hold creationism or intelligent design to be true, it puts much of the power back into the hands of actual educators, where I believe it belongs. Textbooks are only effective tools when the teachers support them and engage with them, otherwise students are not going to recognize them as resources, and they sure won’t take the time to look through them or use them to study. Time will tell whether these changes will have a significant impact on Texas’ textbook and curricula decisions, particularly in regards to science courses. I think the biggest question is whether having teachers and professors on the review panels will push science textbooks back to evolution, discarding intelligent design. Texas continues to be a state where 34% on Texans identify as Evangelical Protestant, and another 50% identify as some kind of Christian (Pew Forum on Religion), and where more than one third of adults affirmed creationism in 2010 (Texas Tribune Feb 2010). Is the Texas Board of Education really taking a step forward? Will the recommended textbooks reflect an increased presence of teachers and professors? Or will we still be seeing intelligent design theories when we help kids with science homework? Live in Texas? Passionate about the textbook throwdown either way? Find who represents you on the State Board of Education at http://www.fyi.legis.state.tx.us/Home.aspx and let them know your thoughts.